“I’m freaked out by you kids. I hope I die before meeting one of you in a job interview,” says Roger Greenberg, memorably played by Ben Stiller in Noah Baumbach’s acclaimed 2010 film, “Greenberg.” Five years later, the actor and director reunite in “While We’re Young,” a film that, in some ways, takes Greenberg’s morbid fascination with modern youth as its jumping-off point. Stiller plays Josh, a middle-aged documentarian still working on a long-delayed project, much to the chagrin of his wife, Cornelia (Naomi Watts), and her father, Leslie (Charles Grodin), a revered, Maysles-type filmmaker. Josh and Cornelia’s lives take an unexpected turn when they befriend a younger couple, aspiring filmmaker Jamie (Adam Driver) and his hip-hop-dancing girlfriend, Darby (Amanda Seyfried). Suddenly they find themselves engaging in activities that are less-than-age-appropriate, leading them to feel much younger than their years. This leads to some priceless exchanges, such as when Josh is informed by his doctor that he has arthritis in his knee. “Arthritis-arthritis?” Josh asks indignantly. “Yes, I usually say just say it once,” the doctor replies. Baumbach spoke to RogerEbert.com about his methods for crafting authenticity onscreen, his excitement over the work of indie filmmakers like Joe Swanberg and why he wishes he didn’t have the Internet on his phone. From the father and son competing for the same young woman in “Squid and the Whale” to the adult heroine unwisely climbing a tree in “Margot at the Wedding,” your characters have often been prone to acting younger than their age. They also tend to be cerebral and inarticulate, and so when they do those things, it’s kind of a source of humor. It’s funny how people can be so self-knowing in some ways and totally off-the-mark in others. The idea that you can analyze the people around you but can’t see yourself is an age-old one, but it is interesting to me. As you point out, the adults in “Squid” and “Margot” are doing more overtly childlike things. Both films are also about family. No matter how much you may feel you’ve evolved, you tend to fall back into the same patterns when you’re around your family. You’re still jockeying for position. In the case of “Margot,” the sisters are still competing. With “Squid,” I was interested in the things parents feel that they can get away with around their kids. They think they’re getting away with them when they’re not. Some of my characters are old beyond their years and some are regressing as they get older. “While We’re Young” is a more overt exploration of what it means to be in your 40s and whether you ever really feel like you’re an adult. There’s a rumor going around that Jamie and Darby’s characters were somewhat inspired by the real-life filmmaking couple, Joe and Kris Swanberg. You produced Joe’s film, “Alexander the Last,” and Kris (like Darby) had an ice cream business. I wonder where that started. Somebody brought that up to me not long ago, and I had never heard it. I guess it’s intrigue on the festival circuit. [laughs] As for Darby’s job, I wanted it to be an artisanal thing, which I thought felt right for the character. What initially drew you to Joe’s work? I came to Joe’s movies at the same time I discovered the work of Andrew [Bujalski] and Aaron Katz. For whatever reason, I became aware of a bunch of those movies around the same time. I thought it was exciting that people were taking advantage of new technology and just making their own stuff and doing it well. The films didn’t try to hide what they were. There was a kind of sophisticated amateur quality about them. They were acknowledging that they didn’t feature real actors in a lot of cases, and I thought they had a kind of real energy that was exciting. Obviously, a lot of those filmmakers have continued to work and thrive. I actually thought “Computer Chess,” Andrew’s last movie, was particularly good. It may be my favorite one of his, I thought it was really great. Those films take a more improvisational approach to their portrayal of inarticulate characters. The fact that they felt improvised was part of what interested me about them. I write very fixed dialogue that sounds somewhat like a fabricated improvisation. What I’m aiming for is naturalism. Once I settled on documentarian as the profession of these characters and the movie started to take shape, I entered into these arguments with the knowledge that I wasn’t going to solve anything. When I wrote Josh’s side of it, I felt very invested in what he was saying. When I wrote Jamie and Leslie’s responses, I was equally invested in what they were saying as well. I don’t mean that as a cop-out, I just think the debate is complicated. Following the tradition of comedy, my responsibility was to resolve the marriage, because that was the main focus of the story I was telling. These debates were really for the characters to have. My job was to give each of the characters as much of a fighting chance as possible and see where it landed. Video essays are increasing in popularity online as a form of film criticism. Would you consider an essay that incorporates your own work an act of theft? I don’t look at a lot of that stuff, so I don’t know how I would feel. I guess it would depend on what it was and how it was being portrayed. I’ve seen some good videos, though. There were some that I saw about the work of older filmmakers where the [editor] takes certain shots that may be prevalent in their movies and strings them together. It can be very arresting to see those images all together. Speaking of juxtaposition, I loved the sequence in “While We’re Young” that cuts back and forth between both couples, illustrating how the young people embrace outdated technology like VHS players while the older people are hopelessly addicted to modern gadgets. That came from my own observations and it seemed like a funny idea to me. I felt that it deserved to be highlighted as its own [sequence], which is, in a way, sort of like the video essays that you’re talking about. I don’t know if I’ve really done something like that before, but I felt like it was a good enough idea that it should be carried through. I’m obviously commenting on a very specific type of young urban couple. I grew up with records and cassettes and in my teens, I was told to get rid of it all and start again with CDs. Then as an adult, I had to start again. When I began visiting younger people’s apartments, I’d see them filled with all these records. I did keep many of my records, so I do still have a bit of a record collection. But when I saw that people were collecting records again, I was like, “Why did I get rid of all that stuff?” [laughs] At this moment, I really don’t know how to collect music anymore. I’m totally baffled. I just got the battery fixed on my iPod because I couldn’t buy a new one. It’s all streaming now. A lot of these new gadgets are great, but what you lose is an attachment to a thing, which is not necessarily a bad thing. But I like having collections of books and records on my shelves. I still have CDs, though I don’t know what to do with them. They each stand as a reminder of the time in which I got them. Even reissues date themselves. [laughs] I remember that first reissue of the Bowie records and I still have the Rykodisc that came out before they were reissued again. Those records bring me back to a particular time in my life, which I like. Though your films aren’t documentaries, you do blend reality and fiction, such as when Frances (Greta Gerwig) visits her parents in Sacramento in “Frances Ha.” The scene became all the more poignant when I learned that it was shot in Gerwig’s actual hometown and featured her own parents. It’s interesting because my movies are very structured and scripted, but I often like to place their fictional content in real situations. 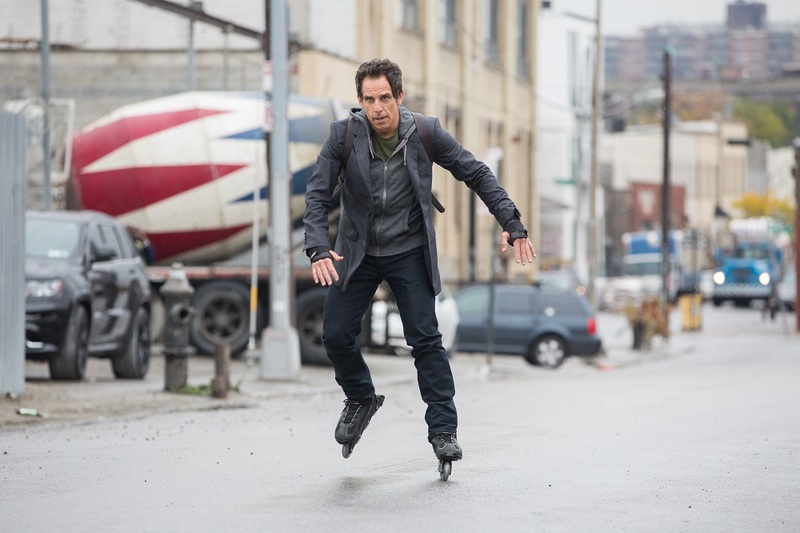 I like putting my characters in real New York locations, such as when I put Ben Stiller in roller blades on the real subway. When it’s Stiller, it becomes more of a challenge, but we still come up with ways to make it happen. One of my favorite shots in “While We’re Young,” just because I like that we pulled it off, is the wide angle of Jamie psyching up Josh for his pitch while crossing Park Avenue. We staged the bike that nearly hits Jamie, but everybody else is real in that scene, and it really is filmed on Park Avenue. I love how fewer things were controlled in the environments of older New York movies. There’s an engagement in the chaos of the real world. It’s true that we filmed that sequence with Frances’s parents in Sacramento, but everything that occurs in it was scripted and staged. It’s not a documentary, though it is aiming for a kind of authenticity that brings something real to the shots that they wouldn’t have had otherwise. Was Frances’s memorable dance down the street to Bowie’s “Modern Love” filmed in a similar fashion? Yes, we were pretty visible. We were filming Greta on a flatbed pickup truck or something, but we shot it kind of high so that pedestrians wouldn’t look at us as much. A lot of people weren’t even noticing us on the sidewalk. Usually in street scenes, particularly those set in New York, I try to use as much real stuff as possible. It’s frustrating because people ruin takes all the time. In “Greenberg” and “While We’re Young,” your adult characters have a complicated view of future generations, epitomized by the scene where Josh and Cornelia regard the unsettling sight of a toddler navigating the use of an iPhone. Do you share in their anxieties? I’ve got no problem with technology. I find the accessibility of the Internet in our lives troubling just because it’s such a distraction, particularly if you work on a computer. It’s like working on a television screen. It would be very hard to get anything done. A computer may be worse than television because we can actually control it more, or we think we can control it more, but we really can’t. It’s a personal thing. I kind of wish that I didn’t have the Internet on my phone. The distraction that it provides isn’t nourishing. But it is what it is. There are times I’m glad that I can check where a restaurant is and things like that. I’ve totally gotten used to the convenience of it. That’s me being cranky, I guess. I’m not worried for our children because of technology. Climate change maybe, but not technology. Perhaps that’s why I still haven’t thrown out my 11-year-old flip phone. As a writer, I’m often in front of a computer, so it’s nice to escape the Internet on my phone. That’s smart, and yet I’m sure there are runarounds you have to do. [laughs] I would like if technology was evened out in a way that would enable those phones to come back.